September is Childhood cancer Awareness Month. Every day this month, I'll be posting about a child we met through my daughter Peyton's journey through cancer from 2003-2004. I also dedicate this series to my brave little fighter Peyton, who this month, has reached the milestone of 5 years as cancer-free. In the cancer world, making it to 5 years is a near-guarantee her original cancer won't come back. But the ugly secret with childhood cancer is that secondary cancers often come back, sometimes as soon as 10 years from the original diagnosis. Ironically, these secondary cancers are caused by exposure to chemotherapy and radiation used to stop the original cancer. As you read about the kids I'll profile, please pray for less invasive cures as research gets better and better. Please pray for the funding of the research, and please pray for the families of the kids effected by the devastation cancer can bring. Jonathan's mom Anne found us through a CCSK site. 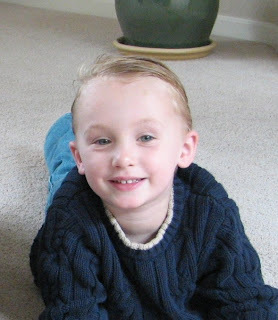 Jonathan had just been diagnosed with CCSK and his parents were scared and looking for information and support. Peyton was about halfway through treatment when Jonathan began treatment and Anne and I emailed alot about quirky side effects from the chemo and how staying positive and full of faith was our only option. Jonathan completed treatment within 8 months of diagnosis and 2 months later, was declared in remission! Today, Jonathan is a healthy second grader who will celebrate 5 years remission very soon!! I love the good news stories of kids who have battled and won.